Thats right! 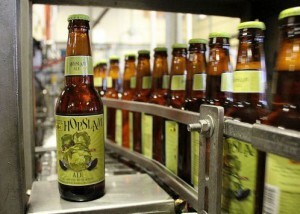 Hopslam is hopping off the bottling line of Bell’s Brewery at this very moment. The very limited Double IPA brewed with honey, six varietals of hops and dry hopped with with Simcoe. Hopslam is a special kind of DIPA that gets better with age (Not common with most IPA/DIPA’s). This beer gives off grapefruit, stone fruit, and floral notes and is rounded out with a malt forward mouth feel and a touch of honey. Look out for Hopslam in these areas on these dates.